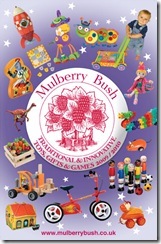 New Mulberry Bush Toy Catalogue out now! What a relief! After several months of hard work our new autumn / winter catalogue of children’s toys is not only printed but is now in the post to our customers. We think it’s the best yet, but we are a bit biased! We’re very pleased to have found loads of new toys which we think you’ll like, and certainly the initial orders received this week seem to show that our new range has the seal of approval from parents and grandparents alike. Online we have introduced four new categories – Wooden Trains, Playfood, Music and Vehicles – reflecting some of the most popular selections in our paper catalogue and making similar toys easier to find. Helping children less fortunate than our own.